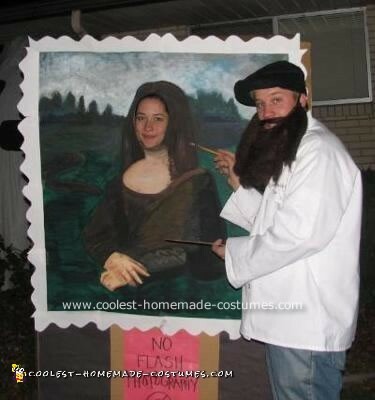 As I was trying to come up with costume ideas, I thought about how everyone wants to see the Mona Lisa in far away France. Why not give everyone here an opportunity?! My friend works at a museum and so she got me a box that they use to ship large paintings. I cut the box down the middle, leaving the top uncut, so it fit like a sandwich board. It was a pretty tall, skinny box. It went all the way down my legs. I then made two duct tape straps to sit on my shoulders and then measured and cut out a hole for my head. I printed off a small image of the Mona Lisa and then sketched it on the cardboard. y husband got in on the action too. He used an old chef coat he had and put a badge that said “Leonardo da Vinci”. He then wore a fake beard and used one of my painting pallets and paint brushes to carry around & used a beret as a painter’s hat. Great job. The painting and hubby look great!!! This is one of the most unique and creative..